Eliminates Vendor lock-in: There is no need to be enchained by vendor or vendors. With state of the art merchant silicon available off the shelf, benefits of technology can be realized without being locked into a specific vendor device. Cost Reduction: As more and more vendors join the marketplace, price of hardware and software becomes suddenly more affordable. This innately reduces CAPEX and OPEX for customers. 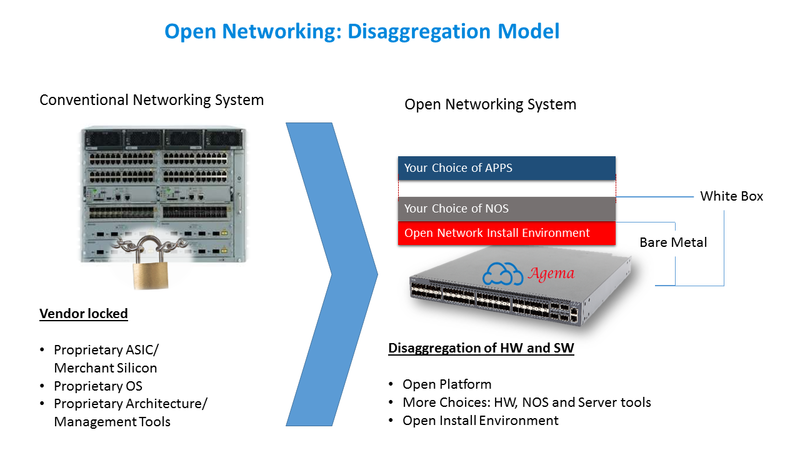 Choice of HW and Software: The disaggregation model in which open networking conception is born innately provides a choice for customers on hardware and software. Figure 1‑1. Open Networking: Disaggregation model. Central to open networking is the disaggregation model that allows hardware and software vendors to deliver their capability on what they do best. For example, hardware vendor can bring best breed of technology from modularization of their platform to make use of state of the art market silicons and on the other hand, software vendors to offer best NOS (Network Operating Systems) or software means for data plane and control plane separation. In doing so, the marketplace has created an apparently robust eco-chain. Some will disagree here but the fact remains that the eco-chain is improving and some parts of it is more realistic now then perhaps a year before. To be more specific, I have elaborated the eco-chain in the figure below. Rather than referring it to open networking eco-chain, I denoted it as “SDN eco-chain” since the central to this initiative is about making network more programmable and service aware. Figure 1‑2. Typical SDN Eco-chain. The programmability is the core element of SDN (Software Defined Networking) for which pundits advocated the decoupling of control and data plane. However, programmability can be done in many ways: through ZTP (Zero touch provisioning), APIs (e.g. Netconf) and OpenFlow protocol (a more conventional notion of decoupling). To my experience, majority of network deployments thus far refrained from purely decoupling model but there are exceptions and distinct differences in deployment. For example, FBOSS that runs as agent daemon uses thrift API instead of openflow to communicate route information with controller. Details of this opensource decoupling software is available at https://github.com/facebook/fboss . Service Providers are more interested about CAPEX and OPEX reduction with choice and flexibility that open networking offers. For example, a provider edge switch that offers flexibility of advance MPLS networks with APIs for model based network configuration and monitoring could best fit their immediate need of transforming networks as oppose to overhauling the network in one go using decoupling of data and control plane. It is in this phased transformation, open networking offers best value but it is not confined by the said as it is encompassing to traditional networks and decoupling of data and control plane. I conjectured even a bigger picture for “Open networking” as it is the fundamental conduit of future network transformation. For it, disaggregation model is paving the way for a more sophisticated network transformation to occur. A vision towards that end would be “Intelligent Networks” one that is provisionable in click, intent-based and self-healed, to name few attributions. Figure 1‑3. 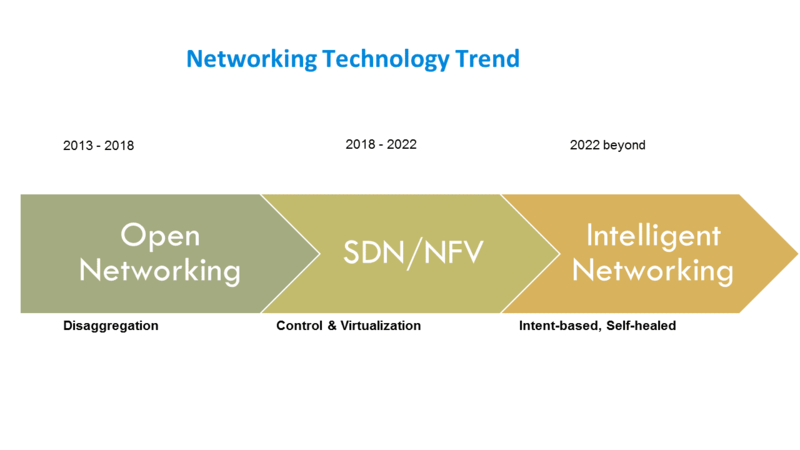 Networking Technology Trend. Affordability, openness and choices are big factors in network transformation especially for service providers since disaggregation model is giving them ability to deliver more service at a fraction of cost that would otherwise be. Moreover, open networking is offering best of both world, the “traditional” and “NextGen”. For example, in a given network deployment scenario customer may prefer to choose their own NOS depending upon southbound API requirements and L2/L3 switching products. A NOS that combines both APIs and decoupling protocols such OpenFlow is known hybrid NOS. The goal here would be two folds, first allow traditional network protocols such BGP to be run at NOS level forming traditional routing architecture and secondly, network topology is passed to Openstack for visibility, orchestration and management. The following picture depicts how such nextgen network abstraction can coexist with traditional networks. Figure 1‑4. Cloudification of Network. Telemetry at each network device can be obtained through Broadview™, an opensource software contributed by Broadcom®. Such deployment not only allows physical networks to be virtualized and cloudified, it is done so without compromising backward compatibility of physical network and the traditional network routing architecture therein. The depiction herein is forward looking and implementation of such network is at the discretion of its designer and availability of suitable hybrid NOS. However, this notion of network cloudification is possible only due to advances in open networking and the eco-chain that supports it. 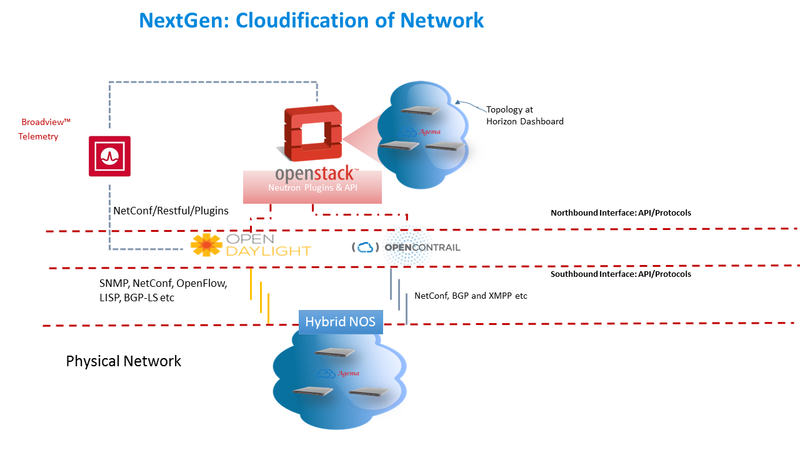 This article is provided herein for educational purpose only implying the importance of “Open Networking” and how disaggregation model helps in realizing NextGen network transformation. I believe other website proprietors should take this web site as an model, very clean and excellent user friendly design and style.